Not to say it ever isn’t but now, particularly, race relations are a contentious and often spoken about point of discussion. Interestingly enough, the realm of comic books has it’s fair share of debate about race within the medium. The unique aspects of the industry and the nature of its storytelling place it in a forum for open debate and discussion, making it a sort of microcosm about racial politics today. Open disclaimer: I am a straight, white male. The only “oppression” I have ever felt was being bullied for reading comic books before they were popular – not much in comparison to what others go through, and the topic of another article entirely. I will also say that I do not believe in diversity for diversity’s sake. It’s a hollow, faux-moral that people rely on to make themselves seem better without furthering any actual good. However, I do believe in diversity, in comic books at least, for one reason above all: every child should have a hero that reminds them of themselves. This is no scholarly article, so I won’t be so pretentious as to cite my sources, but it’s no secret that multiple psychological studies have shown that people relate easier and quicker to those who they can identify as being similar to them, (the subject was even touched on in an article about the superhero Cyclops not long ago). Keep that in mind. Add that to comic books, now predominantly read by adults, but still a vehicle for children as well to find superheroes and delve into their own little worlds. The wonder in a child’s eyes when they discover a hero that they relate to is something to be cherished, preserved, and furthered. Speaking frankly, it’s hard to imagine that there’s anyone who thinks this is a bad thing. There are some but they are likely not willing to participate in a discussion about racial relations in the first place. The crux of the debate is: what is the best way to achieve diversity? In the law, there is a mechanism called strict scrutiny: when a law is passed, it must meet a compelling state interest and must be the most narrowly tailored fit – or, the least restrictive alternative. Strict scrutiny is almost always only applied to laws in regards to race. Obviously there is no equal protection violations involved here, but I think the mechanism itself is worthy of praise and application. As we discussed before, there is certainly a compelling interest in having a diverse plethora of superheroes – role models for children, reader identification, etc. So what would be the narrowly tailored fit? How do we expand a diverse roster of superheroes? The, unfortunately, predominant way of achieving this is “race-bending”. It’s simple – making a white character into a character that identifies as a minority. There are many benefits to this method. No work has to be put into making the name popular, theoretically. The old readers will remain for the character and the new readers will come for the change. But, this method has holes so large that a Quinjet could fly through them. First of all, there is a certain isolation of older readers who are used to reading the character in a certain form. The onus is on those seeking the change to prove why it is not only necessary, but a better option than another method. There should not be a burden on fans to prove why the character that has been one way for 50+ years needs to stay the same. No one is blind to how a person looks – to deny this is to deny the human condition, and is an unrealistic and lofty goal, and not to mention insensible. Second, changing the race *now* doesn’t mean that all those years of publication where the character appeared a different way suddenly do not exist. If someone now only reads the Flash because Wally West is black, which is a tenuous assumption, that doesn’t mean Mark Waid’s run did not happen. It doesn’t mean that it is impossible to read Wolfman/Perez New Teen Titans. So what’s really the point? Someone who becomes that engaged in the character is likely to look at older stories – isn’t that the point of gaining new readers, anyway? This does cut two ways – the stories of the older readers don’t go away. They could vote with their wallet and simply not buy the new comics if they don’t consider the character the same. But that results in less consumption, not more. The third flaw with race-bending is not a logical fallacy, but more a fundamental problem. It’s lazy. The main arguments for it revolve around the assumption that the writer is incompetent. “It’s hard to make a new character, can’t we just change an old one?” It’s a tell-tale sign of someone who is not good at their job trying to attain a goal without actually performing the steps necessary to achieve it. It’s a shortcut, and it’s one found in the utility belt of lesser writers and editors. That’s some of the flaws of race-bending, and while there are probably more, well…uh…you can post it in the comments! Anyway, we’re still left with the question: how can we achieve more diverse comic books, without isolating older fans (the least restrictive alternative)? It’s simple. It’s not easy, but no one said this would be. Get ready. Jaime. Reyes. Introduced less than 10 years ago. 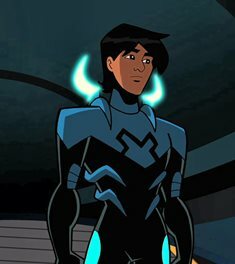 Now considered *the* Blue Beetle. Ted Kord wasn’t turned into a 16 year old Latino young man. His successor just happened to be one. It took time. Taking a pre-established name, making a story around why the transition happened, adding tragedy on both sides, making Jaime likable enough that even tried and true Kord fans like yours truly accepted him as the new Blue Beetle. He honored Ted’s legacy. Jaime is proof that it is possible. It might be slow and gradual, it might take some good writing – what a farfetched thing to ask for, right? But a good writer, matched with a good editor, should know how to make a new character stick. Marvel has never race-bent. Look at characters like Ms. Marvel, a young Muslim woman who is one of the most popular up and comers. Look at Luke Cage – taking an older character, and making him more popular than ever. Now, New 52 DC seems to be stricken by incompetence on every level that isn’t related to Batman, and this is one of them. Making Alan Scott gay – while, by the way, wiping his gay son and strong, female daughter from existence. Making Wally West a bi-racial hoodlum – wiping away the years of stories that made Wally one of the most beloved characters in comic books, and also applying a rather racist set of stock characteristics to him…because all black people are troubled youths, right? Of course, Alan Scott’s character hasn’t changed too much – but Wally is unrecognizable on any level, and is now the comic book equivalent of the monster from the Matthew Broderick Godzilla movie. These might all go to more ingrained problems within D.C., but the point still stands. In sum: more diverse superheroes are a good thing. Create them. Otherwise, it’s a band-aid on a bullet hole.